My rewards for the afternoon antique hunting! I loitered around the gay neighborhood near by this afternoon, came across these 2 beautiful porcelain bowls. 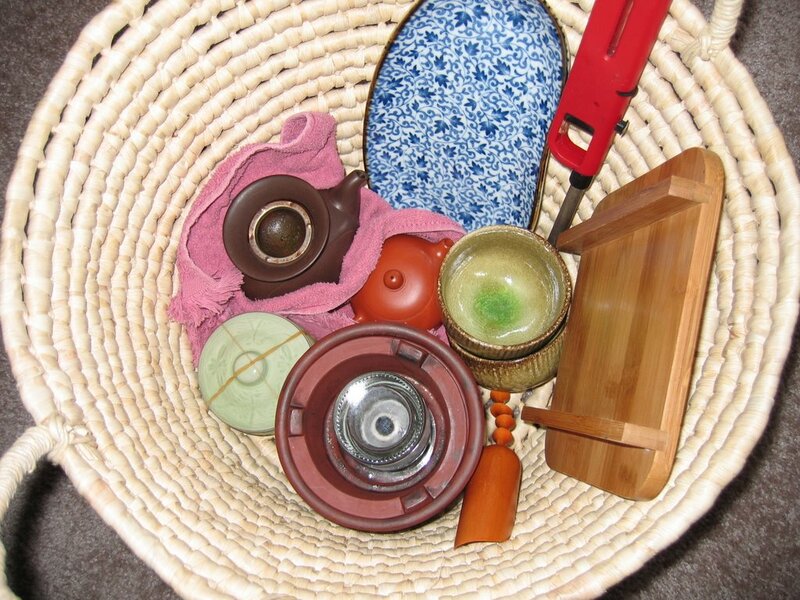 The first bowl is particularly my favorite. Very nice details, even depth of carving, it seems molded or stamped though. Very thin and light weight. It makes high pitch crisp sound when I tap on it. It's a very good size bowl, 350ml. Beautiful curve, traditional Chinese style. The glaze is almond with a touch of yellow in color. I have not seen celadon bowls in this color with this design (Wan Shou Wu Jiang) in recent days. Love it! 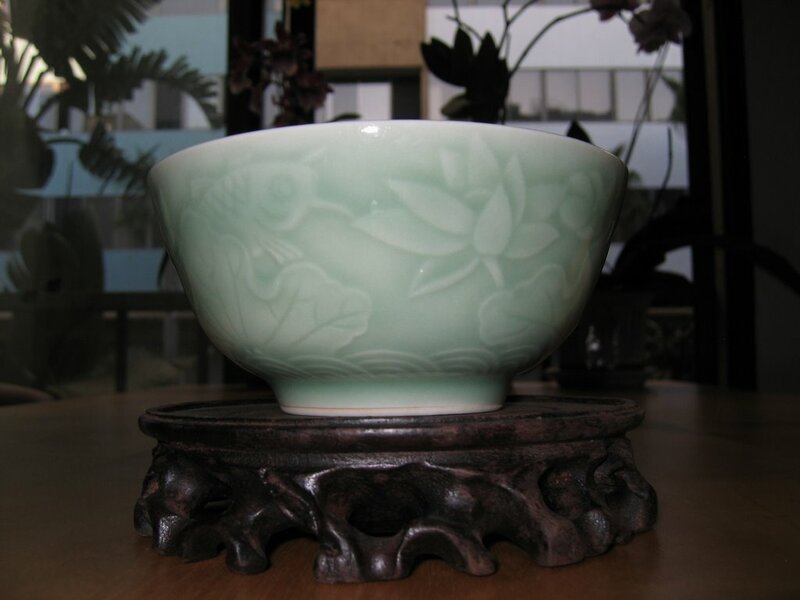 The second bowl is also very beautiful, carp and lotus carving with green celadon glaze. It seems made from a mold as well. Lotus is my most favorite flower, even more so than orchids. I collect orchids because they are easy to find and "easier" to take care of. Orchids are not easy plants by all means. But once you learn a few tricks and live here in Southern California by the coast, the chance of survival is better than say Michigan. 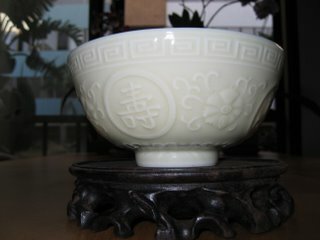 The shape of this bowl is more straight or stiff? It's also heavier and thicker, same size as the first one. Simple with fine details, very attractive! Unknown age Lung Jing from HangZhou, China. I was at my parent's house last weekend, as usual, I look through the cabinets and pantry to find more tea. My father is a tea drinker although not as crazy as I am. There are at least 15 kinds of tea remain unopened at my own home, and I am looking for more at tea shops and my father's reserves. 3rd brew: I added a few blooms of the tea tree flowers, the aged LJ came back to live with honey roasted aroma. I am really digging these flowers! This should be one of those tea for drinking in the office, make a quick cup, it's not bad but doesn't require "high maintenance" type. Lung Jing is not my favorite choice, I guess it's not one of my father's either. 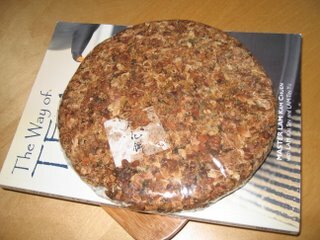 It seems to be aged for at least a year to two. 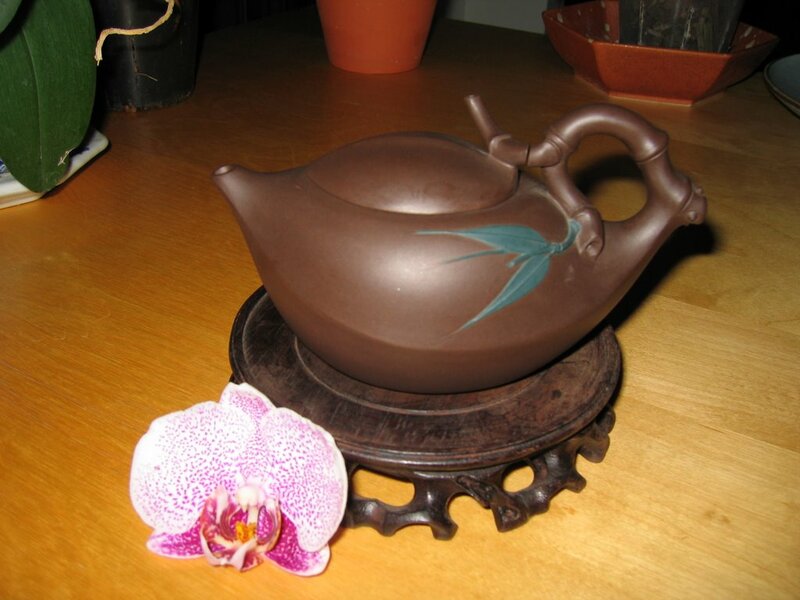 1st prize winner of Taiwan national pottery competition. It comes with a certificate with year, artist information. However I did not have the pleasure of finding out. 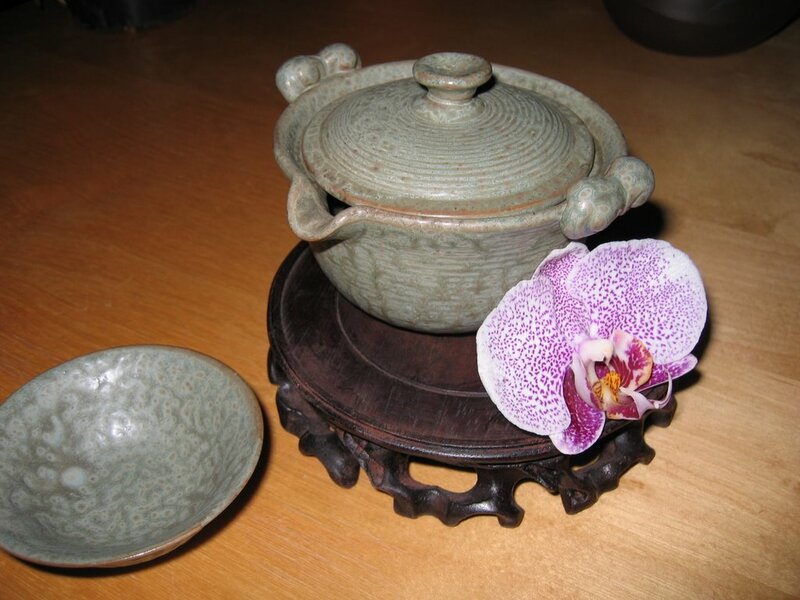 One and only set in the world, currently resides in Ten Ren located in San Gabriel, Ca. Price tag a whopping $12,000 USD that is. I suppose it takes much more knowledge than what I have to appreciate this set of Yixing tea set. I had tea at the beach this evening. I took my blanket, pillow, kungfu tea set, burner, a pot of hot water, a book to the sand, arrived little before sunset and stayed till stars filled the sky, lights were shimmering on the water waves. Orange sky turned into mysterious darkness layered with haze over sparkling stars hanging above. It's breezy but not cold, very humid. Breeze came from every direction. I take my tea every where I go for leisure, especially to the beach. Tonight is the first time I stayed well into the night on the sand. One can experience tranquility at another level. It's difficult to keep water boiling at the beach, finally I had to put the burner inside the basket to shelter from the wind. I chose Huang Jin Gui Ooglong for the night, its light and fragrant character went well with a warm humid summer night. Sorta like floating on a bed of lotus leave, until some one popped my bubble. Water kettle I mentioned previously is slightly bigger with long spout just like what you saw in the video, pouring techniques are not as fancy though. While we are on the subject of tisane, here are a few I have. Lavender in purple, jasmine in white, rose bud in red, osmanthus in yellow. I always like mild light tea, no mater it's tisane or actual camellia sinensis. Half a tea spoon of the small flowers such as lavender, osmanthus is sufficient enough without overpowering your smelling sense and taste buds. 5 rose buds in a cup of boiling water steep for 1 minute is all it takes to bring out the fragrance and sweetness. It can last 3 brews. Jasmine, this particular batch is not good in quality. I am not sure if it'd taste any different for others. My mother just bought a jasmine plant, I'll collect the buds once the plant matures, see if it makes any difference. I remember when I was little, the local Southern Chinese collect flowers from various subtropical plants for tisane, such as fresh honey suckle, Mi Lan (not sure what that is in English), fresh rose, jasmine, etc... Each has it's own health benefit, cooling or detox/cleansing property usually. Tea flower tea? This sounds odd. Anyhow this is a bing of flowers from tea trees. It taste great with only a few blooms at a time. Honey roasted sweet aroma, actual tea flavor in taste. I might try it with some "less great" tea to see if I can create a new concoction. Purchased from an Ebay seller for $12.50 plus shipping. 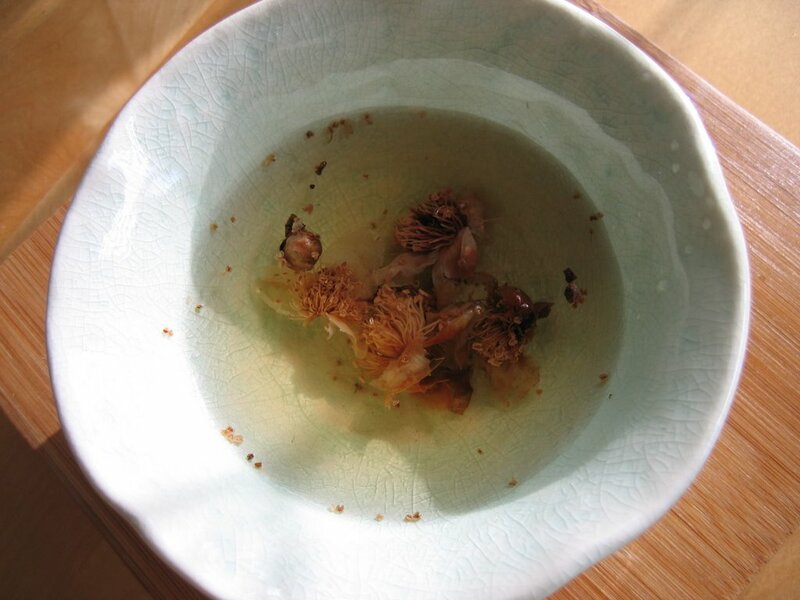 At 5 blooms per cup without resteeping, this bing will last for an eternity. The calligraphy is a nice little souvenir too, I am keeping it on a scrap book. It's actually handwritten.The scent of seed oil functions like a perfume ad in a magazine except better and possibly keeps bugs away too. I broke my little finger a few hours ago..... I won't be able to type much for a while. However I'll attempt to put up some pictures. 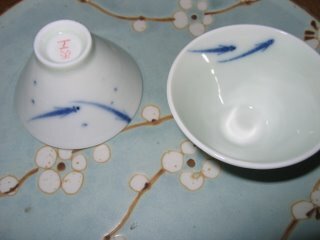 A pair of porcelain hand painted fish cups. Love the classic blue and white, less is more. Wild Pu-erh Qizi Bing 2003, Yiwu, Yunnan. Courtesy of Stephane Erler - Teamasters@blogspot.com. Special thanks to Stephane. 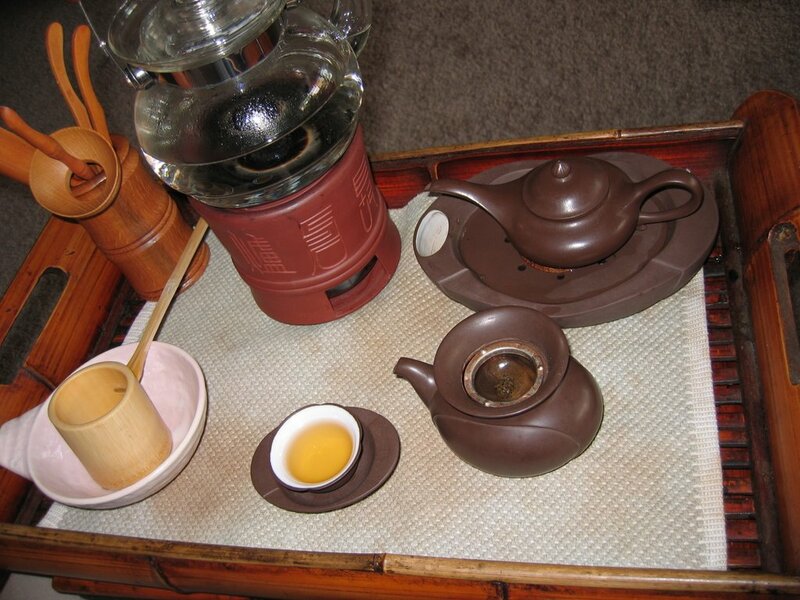 Here is my tasting note of this Pu-erh tea. Tools used as in picture. 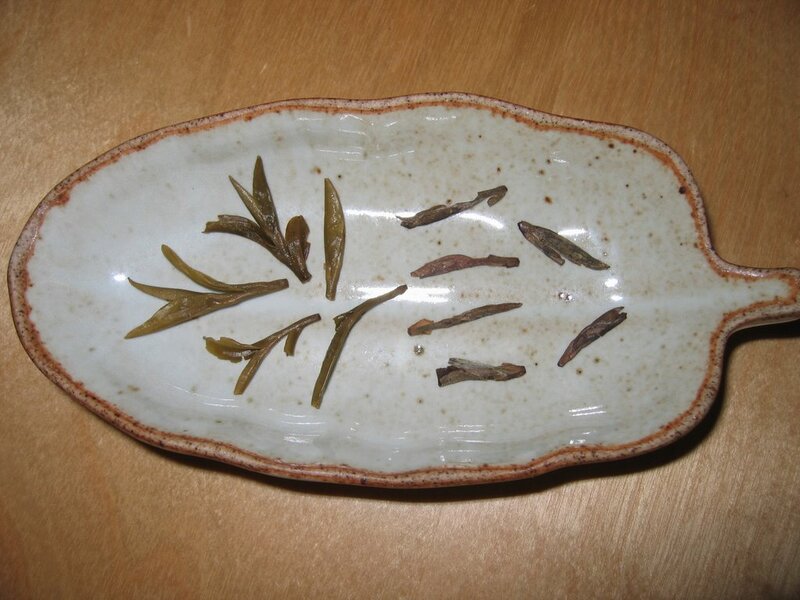 Dried Leaves: Greenish brown, sign of aging green pu-erh; young white haired mixed with mostly matured large leaves; smells like well aged smooth tobacco with light fragrance. 1st brew: medium amber color, a lot of wild pu-erh taste, fragrant with some fermentation taste, no astringency, no sour or bitter taste, good sign of good tea, looking forward to 2nd brew. 2nd brew: medium amber color again, still a bit of the aging pu-erh taste, fragrance is getting more intense, 10 minutes after drinking, a lingering sweet wild floral taste roaming inside of the mouth, very enjoyable, crisp clean texture while and after drinking tea soup. 3rd brew: light amber color, very clean texture in mouth, no aged tea taste, fragrance is still intense, lingering sweet taste with fragrant aroma can be detected with every breath. 4th brew is similar to 3rd, I got 7 good brews out of it. The clean crisp texture made me feel like the next day after a dental cleaning. 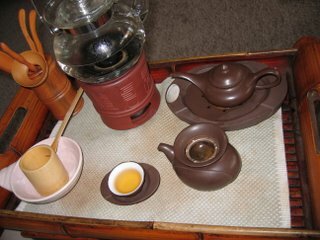 Very lovely tea, the wild pu-erh fragrance is very floral like the scent after a summer afternoon shower. A few from my collections. 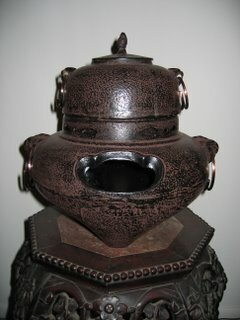 My Tetsubin water burner. I bought this a few months ago at a Japanese store. After the first use, the top part - water container started to rust. I was quite disappointed. At this time, I can only use it to warm Sake. Perhaps there is a way to re-glaze the interior to prevent rusting, which must also be non-toxic as well. Any suggestion is welcome. 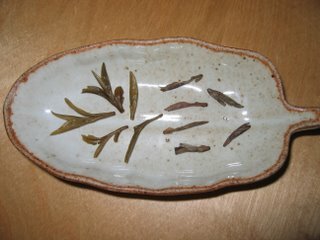 Jasmine tea - there are many varieties of jasmine tea, from china and Taiwan. Common ones from China are in dragon pearl (3 or 4 leave tips rolled into a ball), twisted knots or dragon fly (single leave tip in knotted or dragon fly shape), and small pearl forms (single leave tip rolled into small pellet). Taiwan on the other hand is loose leaves of green tea mixed with jasmine buds. 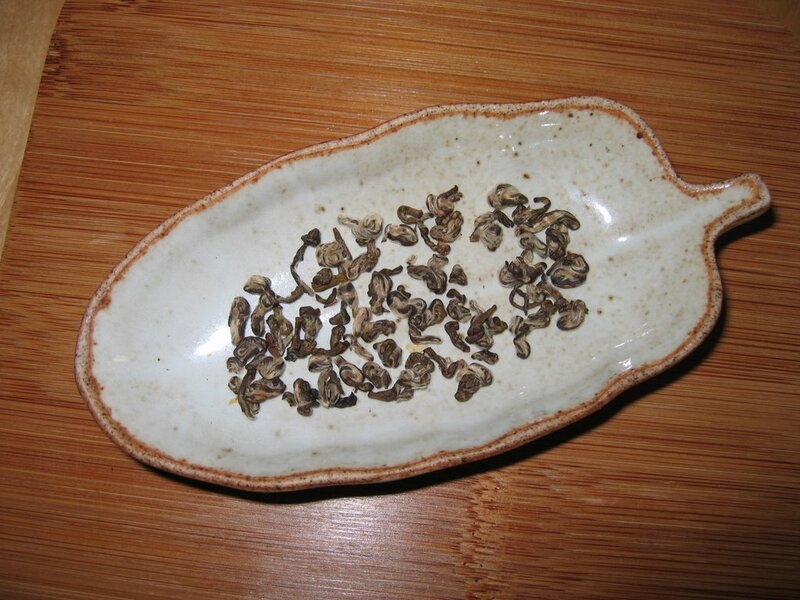 The lowest grade (dim sum) of jasmine from China is also processed the same way as Taiwan. 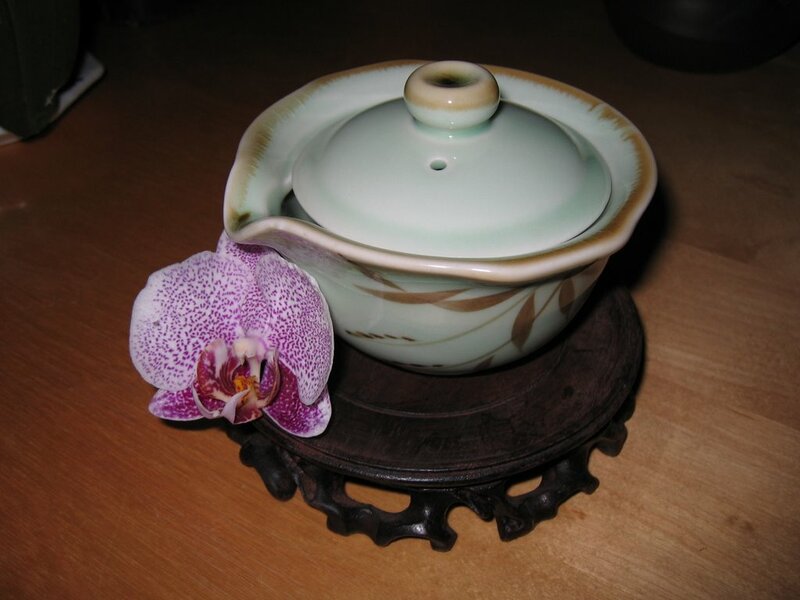 There is an overwhelming demand for jasmine tea in the west. Methods of processing of jasmine tea have also been altered to meet the demand with competitive price. 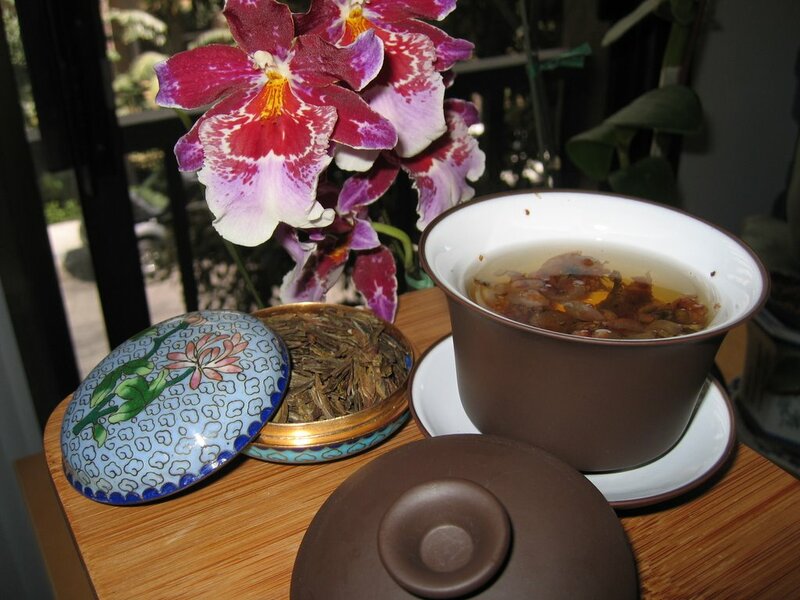 Dragon pearl jasmine tea are commonly scented with artificial flavor. 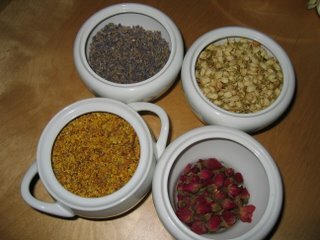 Tea leaves has an amazing absorbing property which made it possible to add floral fragrance for flavoring enhancement. Traditional process of jasmine tea is long and tedious. When green tip tea is picked and processed into dry readily drinkable tea, fresh jasmine flower buds are wrapped in cloth bags, placed in container containing dried tea leaves, sealed for over night, allowing the leaves to absorb the moisture full of jasmine fragrance. 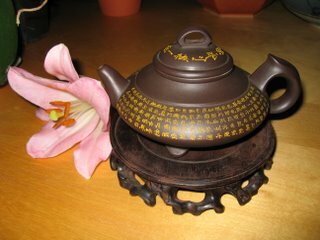 The flowers are then taken out next day, tea leaves are baked lightly to allow moistures to evaporate. New batch of fresh jasmine flowers are placed in sealed container along with tea leaves again for another night of absorption. This process repeats 7 to 10 days for maximum flavoring. The difference in taste is rather noticeable. 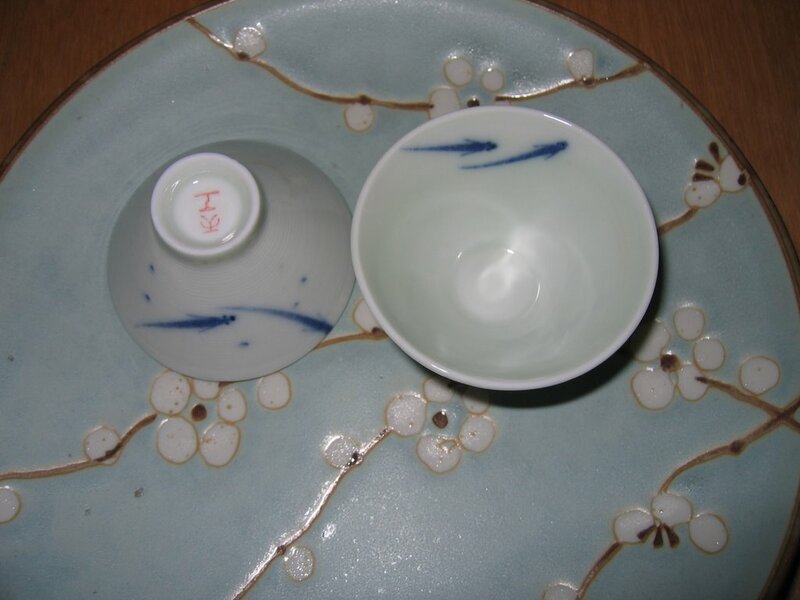 In dry form, artificial flavored jasmine tea associates with a sharp perfume like smell, rather intense and pungent. The naturally infused jasmine tea, on contrary, has a mellow, mild lingering aroma which is very refreshing with a hint of sweetness in the air. The former tea taste also has a sharp chemical flavor, while the later is smooth and sweet, subtle fragrance of jasmine flows above puff by puff. The former will lose the aroma quick after the first brew, while the later can last 3 or more brews. I saved a small amount of a small pearl jasmine tea I came across in Harbin, China 8 years ago. The fragrance still lingers today without a staled smell. Wonderful tea! See picture. 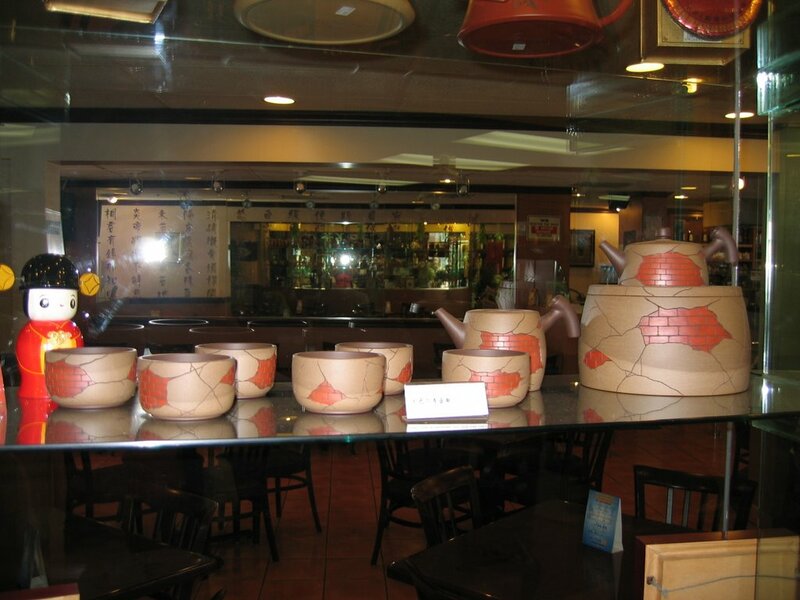 Cultural back ground plays a dominating role in tea drinking habit and tea buying preference. Amount my friends, both Asians and non Asians, Asians are accustomed to drinking tea, and prefer loose tea leaves regardless of the intensity of their knowledge of tea. And because of that reason, in areas where most Asians resides, there are individual tea shops specializing Chinese loose leave tea. 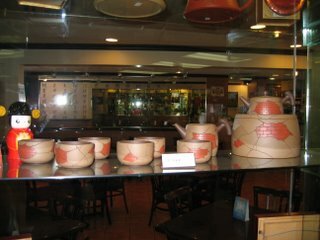 Lower grade loose leave tea is also widely available in Asian grocery stores. Unlike American grocery stores, even specialty food stores like Trader Joe's and Wild oats, you can only find tea bags. Any how, from my experience of trying to introduce Caucasian friends to tea drinking, they are in awe when I made Kung Fu tea for them, however it's not enough to inspire them to start buying loose leave tea. Convenience is the main factor in choosing tea bags over loose tea leaves. They love it when I buy for them. Go figure... I love sharing good things in life. It is my firm believe that in making choice of anything in life, knowledge will ultimately drive us to make better decisions. It's the fact that education helps us advance in career, so it should hold true if we have the inquisitive mind to learn about tea and in turn it will steer us to choose the tea that's suitable for us instead of base on convenience. Tea being such a delicate yet complicate drink, that requires a sufficient amount of time and knowledge to identify good tea, and particularly bring out the best of a tea leaf in an infusion. Majority of American, Asian or non Asian do not have the motivation, inquisitive mind nor the time to cultivate the pleasure of tea drinking. With all the hypes of health benefits associated with tea drinking, mass available supermarket tea bags are what's only known by consumers. Something that took thousands years to perfected will not be immediately adopted by a young country like US. Even the Europeans have been drinking tea since the 17th century, have yet to grasp the spirit of tea drinking like Chinese do today. The way Americans consume tea will remain focused on tea bags of lower grade leaves for many years to come. Surveys show only 5% of tea sales compare to 95% coffee at any coffee houses in America. I was also amazed of the number of attendees at the Tea-expo at Las Vegas in March of 06, 3500+ was considered a great turn out compare to last years attendee.